The Preliminaries. Evaluating a video plug-in package is like walking through a fine art show room. Everyone will have a personal favorite, but no one will like everything they see. And, of course, the price has to be right. BorisFX Software's recently released BCC5 FXPlug for Motion and FCP6 is as close to a perfect art collection as you'll find. Wide ranging, diverse, and powerful, this collection provides options for just about everyone's palate. There are a few disappointments, omissions, and shortcomings, however -- mostly in the delivery. More on that later. 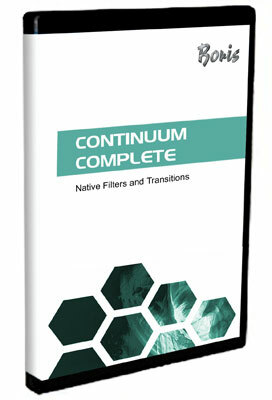 The package ships with one hundred eighty (180) filters, transitions, and generators for Motion 3, and Final Cut Pro 6. BCC5 is compatible with Tiger (10.4.10), and is being tested in Leopard (10.5). Some plug-ins leverage OpenGL acceleration to speed rendering, and others do not. The company web site provides the specifics. A fourteen (14) day trial download is available. BCC5 adds new filters and improves others, but retains the basic control pane/interface. Several new plug-ins arguably replace more expensive stand alone applications designed for the same purpose. For example, BCC5's UpRez filter converts SD footage to HD formats, and its "pan and zoom" filter controls movement on stills. However, in my view, neither of these two features are equivalent to the stand alone applications they ostensibly replace. Nor are they as expensive. Most new plug-ins come with a learning curve, but the company tries to assist in a couple of ways. First, tutorials are available at the web site to explain basic functions and detail workflow. Second, most new (and retained) plug-ins include multiple presets that serve as starting points and can be modified -- a nice feature. Other filters are more mainstream and familiar, and there are ten specifically identified OpenGL hardware-accelerated filters in the package. The Good, The Bad, and The Beautiful. Working with some plug-ins is not always smooth and intuitive, as I noted above. For example, the UpRez and "pan and zoom" filters are emblematic of what is good and troublesome about BCC5. Up rezzing SD footage to HD in BCC5 is a multistep procedure. Fortunately, BorisFX provides a instructional iTunes pod-cast to minimize the pain and explain the steps. Similarly, the "pan and zoom" plug is awkward, in part due to the limitations of the FCP interface. Setting positions, center points, and scaling isn't a simple task in FCP, or any NLE for that matter due to the absence of sliders to control these parameters. BorisFX provides tutorials for both these plug-ins as well as all new filters -- prism, LED, scanline, damaged TV, turbulence, noise map 2, and color checker filters. Most legacy transitions, generations and effects work uneventfully, and provide numerous controls and parameters to achieve the look you want. They include glows, glints and glitters, wire removal, lens flares, "witness protection," various "damaged" looks as noted earlier, and a host of new, exotic transitions and filters. Many are 16-bit. The new de-interlace filter works with 60i footage and uses a reverse telecine generator to convert 29.97 video footage to 24p with pulldown. Render speeds depend on your CPU. BorisFX has arranged the control panes to reveal additional parameters by clicking on a check box in the pane. You then work in a less cluttered workspace. Help files for each filter are accessed directly in the filter pane. Most remaining plug-ins graduated from previous versions of BCC, and some are accelerated using OpenGL and Apple's FXPlug architecture. However, the company informs me that none are RT due to an issue that Apple is attempting to resolve. The Activation Process. BorisFX ties product registration to your computer's unique machine ID. A move to a different machine or HDD reformat requires a new license code. Contact the company in advance of either move to minimize down time. I don't like activation schemes, but I respect a company's right to protect its property. Multi-seat site licensing packages are available at attractive prices. Summing Up. BCC5 is distinctive in the sheer breath of the packaged tools. While you won't need every filter, there are so many attractive elections in the package. BorisFX attempt to bundle the equivalent of standalone apps as part of the package is a mixed bag. While a nice approach that adds value to the purchase, in some cases there are trade offs in workflow. The other consideration is the price of the package. At $895.00, BCC5 is nearly the price of a full version of FCS2. I suspect the price is prohibitive for infrequent users of filters. But before you decide, download the fourteen day package and give the package a test drive. You may be surprised. And at about $5.00 per plug in, BCC5 appears pretty well framed.